I'd like to dedicate this post to mercury glass, and my current obsession with it, and its awesomeness. 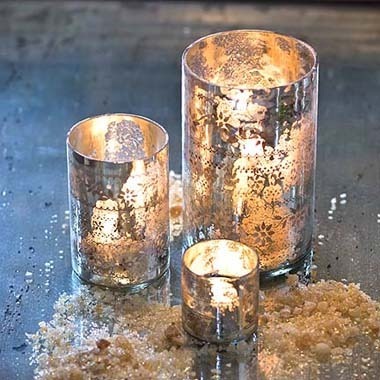 Remember how 4 or so years ago, crackled glass was all the rage, and you could get that sweet effect in everything from candle holders to champagne flutes?- Well, this is better and a thousand times cooler than crackled glass. First off- what the heck is mercury glass? Well, mercury glass refers to silvered glass, that, when blown with double walls, a liquid silvering solution is inserted, and then sealed. The result is a haphazard shimmering effect, that is heightened with a light source is reflected behind it (i.e. a mercury glass votive holder). While I'm generally of the opinion that anything is DIYable on the cheap, I'm not sure if this is acheivable with this finish. There's numerous tutorials circulating online on how to get a mercury glass effect, but all of them involve using Krylon Looking Glass Spray Paint- a mini spray can that is practically obsolete- and can run you about $15 per can. For cheaper, you could get some mercury glass votive holders or vases from most home decor stores. There's a certain satisfication about doing something yourself- but at the same time, if I could get the same effect for significantly cheaper, I'm likely to choose that option. With Christmas looming around the corner, I'm on the look out for any decor in this finish, and hope to incorporate some of it into our decorating for this year. Speaking of which, one thing I often struggle with at this time of year is when is it considered too soon to bust out the Xmas decor? I know that the answer is personal and everyone has a different opinion, but Fall is legitamately around for another month and a half, and I spend so much time waiting for September to approach to bring out the Fall accents- it just seems short changed to only have it out for a month or two, and then to transition to Christmas so quickly. If possible, I think I'd like to try a slow transition. Maybe throw out a few rotting pumpkins, incorporate some metallics and silver candlestick holders. And save the tree for another few weeks. Knowing us though, Christmas will probably hit our home by the time the weekend is through.